July 4th just wouldn't be the same without a BBQ. In my family, as with most holidays, everyone chooses a different something to bring, and we wind up with a fabulous spread. I always like to bring something patriotically colorful. In the past I've done a Red White and Blueberry Trifle and also a Raspberry Pretzel Delight. 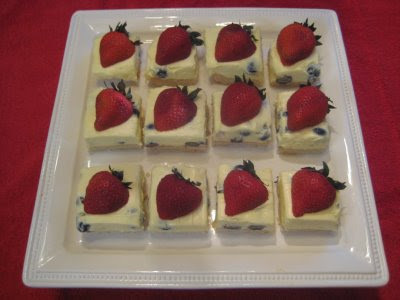 Here's another red white and blue dessert that is as simple as it is rich and creamy and delicious. To make crust, sift together flour and sugar. Using two knives, cut butter into sifted mixture until it resembles coarse crumbs. If you have a food processor, it's easiest just to throw everything in with a metal blade and pulse until it is well combined. Press firmly into an 9" x 13" baking pan and bake for 20 minutes or until lightly golden. Cool completely. In the meantime, make the filling. Beat cream cheese and sugar until creamy. Gradually beat in milk. Add vanilla extract. Add dry pudding mix. Mix well. Gently fold in blueberries. Spread filling over cooled crust. Refrigerate several hours or overnight until set. Cut into 24 squares. Slice each strawberry in half going right through the stem. Place a strawberry half, cut side down, on top of each square. Use any flavor of pudding you like. Be creative! A white chocolate pudding would make your squares a true red, white, and blue. A lemon pudding would also work beautifully. If you like raspberries instead of strawberries, go for it! You could even add flavored extracts, such as lemon, orange, almond, or coconut in addition to the vanilla. Whenever I make any kind of squares, I like to remove the whole batch from the pan in one piece, which makes it easier to cleanly cut it into perfect squares. This recipe, however, doesn't lend itself to doing that. So, here's the solution: Make a sling! Before you bake your crust, place a large piece of parchment paper in the pan, making sure you have several inches hanging over each side. Press your crust over the paper and proceed with the recipe as usual. When you're ready to cut it into squares, use the parchment paper to lift it right out of the pan onto a flat surface. Now you're ready to cut it into perfectly perfect squares! Oh, be sure to run your knife under hot water before you make each cut. It really makes a difference. Presentation is everything!